If you are trying to make a little money, then you might want to try copper recycling, as there are companies who would pay you for any scrap copper that you may have. From building work that you might be having done at your home. You may find that a lot of your pipes are made from copper, and this means that you could make some money from them as scrap. If you know any family or friends who are having work done, they may be happy to let you take their copper waste off their hands. It will be easier for them, and you will get a little money out of it, so it is a win-win situation. Keep your eyes open when you’re out and about. Unfortunately, lots of people think it’s okay to throw away metal in public places – but if you spot it you can clear it up and get paid for it. 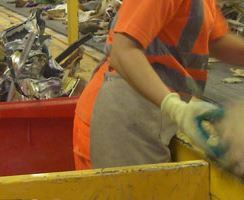 If you have a lot of copper recycling to be done then you may need some help. With our equipment and experience we can give you just that, so why not give us a call and let us know how we can help you?